Type specimen of Zhenyuanlong, doing its best Archaeopteryx impression. Just a short PSA today, and once again, it's about a paleoart meme that has outstayed its welcome. Microraptor was the first time we got a good look at the feather pattern of dromaeosaurids. This is a big problem for two reasons. One, microraptors were small. That means that artists who were looking at them to extrapolate for bigger, more famous "raptors" could easily and somewhat justifiably write off their huge wings as a product of their size. Sure, we thought, microraptors had big wings, but they're tiny animals. Surely the bigger, more terrestrial dromaeosaurids didn't need such big wings. They probably still had wings, but they'd be smaller. Why would Velociraptor need such proportionately huge wings if it couldn't fly or glide? Meme number two: that tail. I admit to being one of the first to go overboard when I fell, head over heels, for the "puff tailed dromeosaur" fossil (now the holotype of Cryptovolans, a synonym or close relative of the Microraptor) back around 2000. This was the first evidence we had of the tail feather style in dromeosaurids (or evidence that they even had remixes and rectrices at all. Remember When Dinosaurs Ruled America? That was plausible at the time it was being made). Naturally, having Microraptor plus Caudipteryx showed that the ancestral condition of pennaraptorans was a fan of feathers at the tip of the tail, not a fuzzy Sinosauropteryx like tail or a fully-vaned Archaeopteryx like tail. So artists ever since have been drawing dromeosaurids and troodontids and oviraptorosaurs with microraptor tails. But that turned out to be wrong! It's an accident of history. We're now learning that Microraptor and Caudipteryx are weirdos. Feathered non-avialan dinosaurs seem commonplace now, and it's hard to believe that there was a time, in living memory for some of us, when they were purely speculative. It makes sense, of course: once scientists realized (then realized again) that dinosaurs were the closest fossil relatives of birds, it was only natural to suggest that feathers had appeared in dinosaurs before they showed up in birds. To have a new type of animal, like Archaeopteryx, appear more or less fully formed with flight and feathers occurring simultaneously makes little sense in terms of evolution. Obviously, even if Archaeopteryx was considered the "first bird" or could fly in some rudimentary manner, it couldn't have been the first animal with feathers or feather-like integument. Feather-like structures had to have been present in the archaeopteryx's closest relatives. But what were those? For most of the 20th century, the answer would not have been dinosaurs. "pro-avis" model at the Grant Museum, London. Speculative bird ancestors with feathers or feather-like scales had been hypothesized and illustrated long before the first true feathered dinosaurs appeared in paleoart. 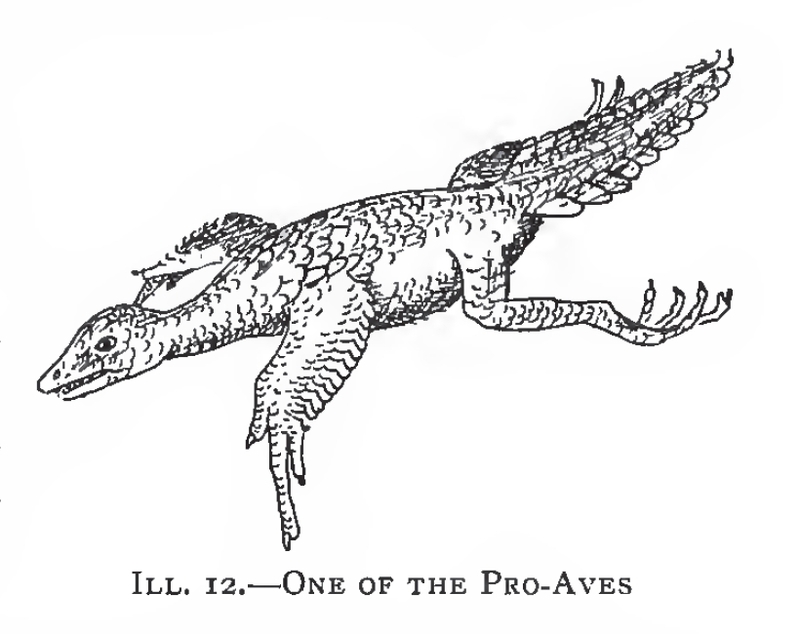 These hypothetical "pro-aves", as they were generally termed, were first imagined by William Pycraft in 1906. Pro-aves were usually considered arboreal, gliding animals with elongated, feather-like scales, and Pycraft's illustration provided the template followed by many later illustrators, like Heilmann's 1916 version, and Burian's gorgeous but even more lizard-like 1960 rendition. Not all pro-avis illustrations followed this template, though. 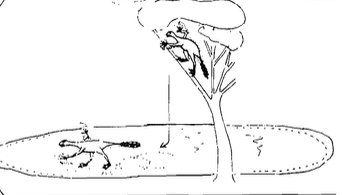 In 1907, Baron Nopcsa invented his own pro-avis, illustrating his hypothesis of a running, "ground-up" origin of bird flight. In addition to his illustration, Nopcsa created a wax model. 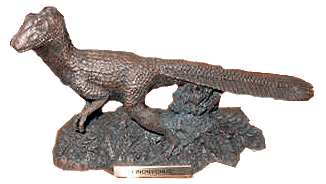 Nopcsa thought birds might have evolved from quadrupedal reptiles which became more and more bipedal as their running speed increased, passing through a phase similar to Compsognathus, though not necessarily dinosaurian. There were also creatures like the "tetrapteryx", a speculative stage in the evolution of avian flight proposed by William Beebe in 1915. Beebe illustrated an Archaeopteryx-like creature with smaller wings as well as hind wings on splayed legs, reminiscent of early (but incorrect) illustrations of Microraptor. Other than the posture, the general anatomy of this hypothetical creature ended up being prescient by accident. His rationale for this hypothesis was the observation that some bird embryos develop and then lose feather quills on their legs. Heilmann, however, rejected this hypothesis after failing to find evidence among other bird embryos. New evidence to support this hypothesis was discovered in species like Microraptor, Anchiornis, and Sapeornis, which had various degrees of airfoils present on their hind legs, a line of evidence independent of the one supposed by Beebe. Though dinosaur-like in appearance, both Beebe and Heilmann considered the ancestors of birds to be "thecodont" grade archosaurs, not dinosaurs, so these hypothetical feathered thecodonts predated the first feathered dinosaurs in art. leaving feather traces in its trackway, from Ellenberger 1974. The thecodont origin of birds did not truly give way to a dinosaur origin until the 1970s, after John Ostrom described the similarities between Archaeopteryx and Deinonychus. If dinosaurs were the new closest relatives of birds, then at least the most bird-like among them should be depicted with feathers (Ostrom himself disagreed with this though, and, according to Bakker, he fought the idea that Deinonychus should be feathered). Of course, which dinosaurs were most closely related to birds, and just how much of a gap remained between them and Archaeopteryx, allowed for considerable wiggle room and speculation. In 1974, Ellenberger identified what he considered to be trace evidence for feathered dinosaurs from Lesotho, in the form of possible feather imprints and footprints which could have been made by small animals parachuting from trees, dragging their tail feathers in mud, etc. He illustrated a small bipedal dinosaur with feathers in the accompanying paper, along with totally speculative skeletal restoration of a new type of animal, nested within theropod dinosaurs, which he called "carnavians." Molnar, in 1985, dismissed the suggestion that these were feather imprints. 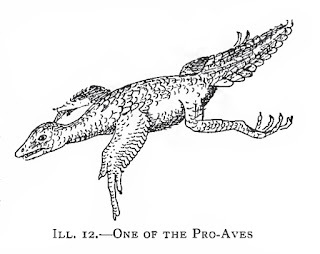 Still, Ellenberger had become the first person to ever illustrate a non-avialan dinosaur, however hypothetical the species, with feathers. Landry's influential 1975 restoration of "Syntarsus". The next year, in 1975, a more famous feathered dinosaur illustration of a much better-known species was provided by Sarah B. Landry, drawn under the direction of Bob Bakker for his seminal article in Scientific American, "The Dinosaur Renaissance." Landry and Bakker depicted the small theropod "Syntarsus" (=Coelophysis) covered in overlapping feather-like scales or scale-like feathers, similar to Heilmann's "proavis", and a long tuft of feathers on the head. The choice of species was not a coincidence. Michael Raath, who had described Syntarsus in 1969 (the same year as Deinonychus), was quick to tout how bird-like it was in popular books and articles, and he suggested several times that it may have been feathered. To understand the impact of this "first" feathered dinosaur, just look at the rest of the 1970s and early 1980s. It was Syntarsus, not Deinonychus, which was consistently drawn with feathers from then on. Many of these later reconstructions even directly aped Bakker and Landry's style of feather crest (or slightly modified it), making "Syntarsus with feather crest" a bona fide paleoart meme. 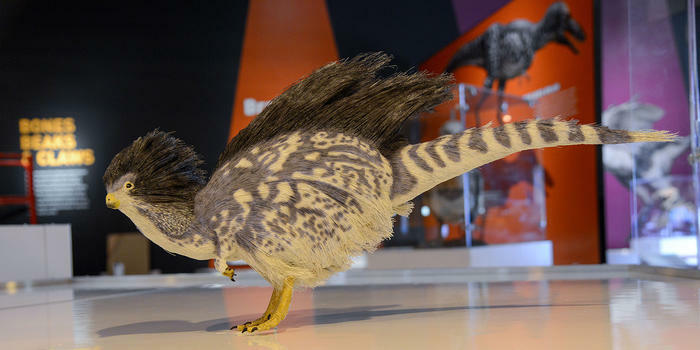 Many of these left out the more subtle body feathers of the original, unfortunately, possibly influencing decades of "half-arsed" theropods with feather mohawks, up to including the dinosaurs in the 2001 film Jurassic Park III more than 20 years later. (One notable exception to the Syntarsus trend was also a watershed moment for paleoart. After reading Bakker's article, a paleoartist named Gregory S. Paul drew his first feathered dinosaur: an Allosaurus). One of my favorite derivatives of Landry's Syntarsus illustration is one made in 1976 by William Stout and reproduced in Don Glut's 1982 edition of The New Dinosaur Dictionary. Though Glut pointed out that the feathers were speculative, they're probably less inaccurate than the legless snake it's eating! 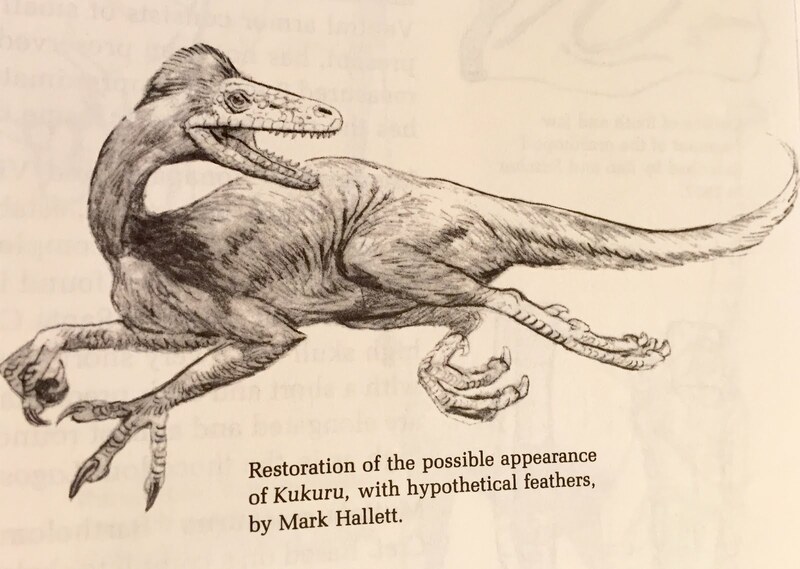 Also included in Glut's revised dictionary was one of the first illustrations of the theropod Kakuru, by Mark Hallett. Though just as speculative as Ellenberger's drawing (Kakuru is known only from two limb bones), it has more of a modern feel. The reclining theropod is decked out in long, filamentous feathers, rather than the broad, scale-like feathers of Landry's Syntarsus. It's worth noting that all of these early drawings of feathered dinosaurs had bare or scaly faces. This method of emphasizing the transitional character of early feathered theropods was probably inspired by traditional portrayals of Archaeopteryx, a "bird" with the head of a "reptile." Many bird-like dinosaurs actually had feathers covering some or all of the face as well as the body, though some kind of "modular evolution" did occur to a degree in a few lineages (here's looking' at you, Darwinopterus). And some Mesozoic dinosaurs, most famously Kulindadromeus, seem to have feathers restricted to certain body segments with abrupt transitions between feathery and scaly regions. So, this much-maligned meme isn't necessarily out of the question, at least in early feathered lineages. A few very early books featuring extremely prescient feathered dinosaurs came in 1978 and 1979. 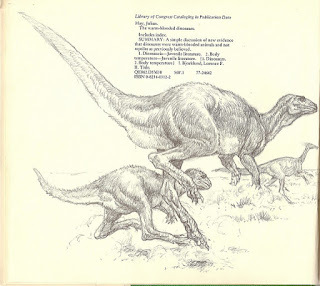 First, Julian May brought us perhaps the first renaissance-era dinosaur book for kids, The Warm-Blooded Dinosaurs, which featured not only a feathered Struthiomimus by Lorene Bjorklund on the cover, but several feathered ornithischians inside. An Iguanodon looks sort of ambiguously feathered (it might just be the crosshatched style), and interestingly, has a abrupt transition to a croc-scutes tail very similar to Kulindadromeus. There's also a skeletal of Microvenator with a fuzzy, Greg Paul style silhouette outline. The next year, Archosauria: A New Look at the Old Dinosaur by John McLoughlin includes some species with feathered faces for the first time, like his amazing, feathered Coelurus. It's odd as a modern reader to see that in both of these books, it's the more basal dinosaurs shown with feathers. Primitive ornithopods and "coelurosaurs" (considered a paraphyletic grade of early, ancestral dinosaurs at the time) like Syntarsus, Coelurus, and Saltopus are given feathers while deinonychosaurs like Saurornithoides and Deinonychus are not. The influence of the thecodont theory was still going strong, with birds thought to have evolved from the earliest dinosaurs rather than deinonychosaurs, which were exclusively known from the Cretaceous at that time. Kakuru by Mark Hallett, from Glut 1982. Ironically, Deinonychus, which out of all these dinosaurs was most similar to Archaeopteryx, did not become consistently or even frequently depicted with feathers until the at least the late 1980s. This was also probably due, in part, to artistic inertia. 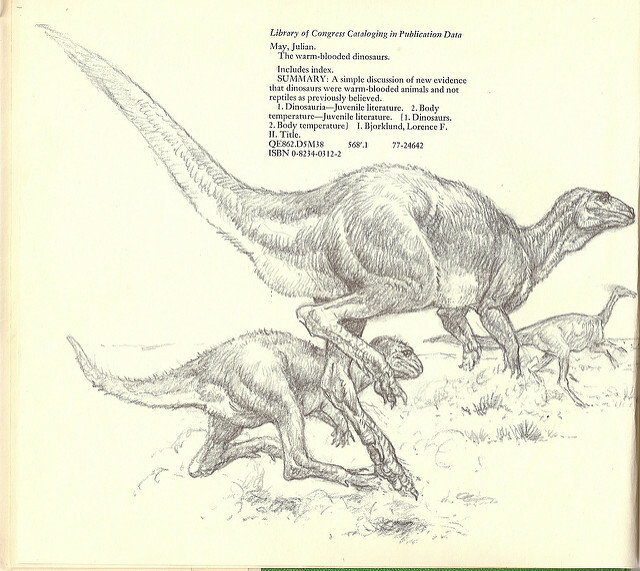 The original illustration of Deinonychus that accompanied Ostrom's description was so iconic that it was being copied well into the '90s. One of the first depictions of a feathered Deinonychus was a statuette produced by sculptor and founding father of Neopaganism Otter Zell (aka Oberon Zell). If anybody who owns a copy of this statuette wants to trade it for my right arm, please let me know. After Syntarsus, the next non-avialan to become consistently depicted with feathers was Avimimus. From its first discovery, Avimimus was interpreted (and in some cases, like the supposed lack of a tail, misinterpreted) as being as birdlike or more than Archaeopteryx. Though commonly misreported online as having quill knobs, Avimimus actually had a flat ridge on the ulna which has been interpreted as a similar kind of support for the soft tissue of a feathered wing. 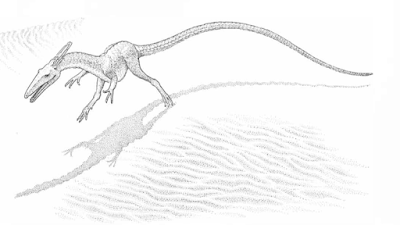 Though not the same kind of direct evidence as quill knobs would be, most paleoartists ran with the suggestion, and most early Avimimus illustrations did portray it with feathers. 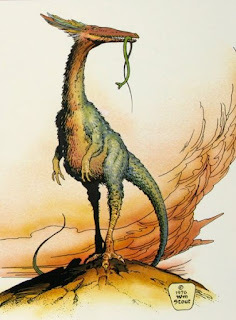 John Sibbick restored it that way for David Norman's 1985 Illustrated Encyclopedia of Dinosaurs, and his version is a down-right throwback to the "pro-aves" of the early 1900s, with long, scale-like feathers on the outstretched arms and tail. a statuette by Otter Zell, 1984. 1986 saw the publication of Bakker's The Dinosaur Heresies, filled with his own illustrations of feathered dinosaurs, including Deinonychus. (Stout and Paul had both continued to illustrate feathered dinosaurs up to this time, though not all were published or widely distributed at the time). Bakker's book opened up the door to more mainstream portrayals of this controversial subject, and it's no coincidence that many other artists were working the occasional feathered dinos into books and articles in the years that followed. Most notable among these were Paul's Predatory Dinosaurs of the World in 1988, and children's books inspired by it like The News About Dinosaurs. From then on, every "renaissance" era dinosaur book worth its salt included at least one speculative feathered theropod. Some books were bold enough to become the first to put "Feathers On Bloody Everything" (to quote the lament of some current-day feather detractors), theropods and ornithischians alike, as in 1988's speculative evolution book The New Dinosaurs by Dougal Dixon. Two early restorations of Avimimus. Left: by Sergai Kurzanov, looking very bird-y. Right: By John Sibbick from Norman's Encyclopedia, looking very much like Heilmann's "pro-avis." By the time the first actual feathered dinosaur was announced in 1996, dinosaur fans, if not the general public, had been well prepared and had even come to expect such a find to be inevitable. The fact that this first find was Sinosauropteryx unfortunately reinforced some stereotypes that had been perpetuated by early renaissance era paleoart, such as short, fur-like feathers, naked legs and bellied, and half-feathered faces. Paul essentially invented the latter meme in an attempt to make his theropods look more bird like (by suggesting a sort of beak), and while this was his own personal speculation, many later artists ran with it, including in early drawings of Sinosauropteryx. The fossil appeared to support the hypothesis, which would have been an incredibly lucky guess for Paul if not for the fact that the snout past the eyes on that specimen had not even been fully prepared out of the rock (maybe, just maybe, because the scientists themselves were so influenced by Paul that they didn't expect any feathers to be found there!). Tianyulong sculpture by Jason Brougham, 2016. In a way, modern paleoart is still struggling to shed the memes and conventions generated by this pre-evidence feathered dinosaur artwork. Many artists are starting to critically examine just how far-off much of that early art really was, and to realize that it was, of course, just pure speculation about what may be, not informed speculation based on fossil evidence. Many dinosaurs, especially non-avialan coelurosaurs, had a feather covering that was much more Archaeopteryx-like than any of those pioneering artists could imagine. It's only recently that many of the best artists have been going back for inspiration not to Landry and Paul and Bakker, but to the earlier artists who were drawing Archaeopteryx and the various "pro-aves". This new era of paleoart, part of what Tom Holtz has dubbed the "Dinosaur Enlightenment," will no doubt generate its own set of tropes which will need to be overcome by the next generation of artists. We're already seeing that with the dogmatic insistence from some quarters on a certain standard of feathering for all dinosaurs when the fossils are starting to suggest much more variety. With any luck, the internet will allow this new generation to push forward and more widely and rapidly share new ideas and possibilities about what feathered dinosaurs can be.